An interesting side effect of Google Notebook's integration with Google Bookmarks is that you can now bookmark search results without having to install plug-ins or use bookmarklets. When you log in to a Google Account, a new option appears next to each search result: "note this". If you click on "note this", Google will open a small version of Google Notebook and add a link to the search result, the title and its snippet as a note. Google's service has a predefined notebook that stores bookmarks (Unfiled bookmarks), so Google also creates a bookmark from your link. The only thing you need to do before clicking on "note this" is to make sure that the active notebook is "Unfiled bookmarks". You can click on the "My Notebooks" link from the top of Google's search results page to activate that notebook. After bookmarking a page, you can add labels and comments. 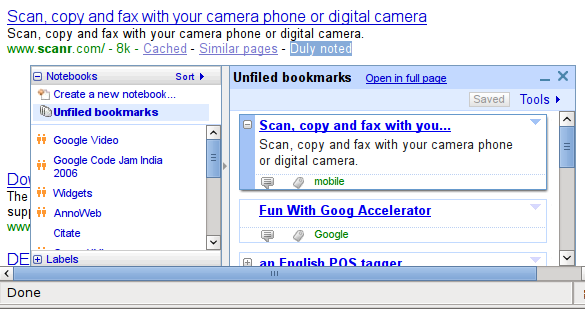 The bookmarks can be accessed from Google Notebook's mini-window, Google Bookmarks or from an iGoogle gadget, but also from plug-ins like Google Toolbar. One of the toughest things with this approach is to file the bookmarked search results (for that matter any "noted" content) in proper folders. You have to do this extra step to tag the Bookmark or file it in a proper folder. Whereas using a bookmarklet, you can tag your stuff. It automatically becomes organized. I would like a small window opened when you click note this, which should allow you to organize your search results. There is no "Note This" option when using Opera V9.5 (beta). Does anyone know if a rollback to Opera 9.25 would give this option ..? # Clip and collect information as you surf the web. # Stay in your browser window. I've been using the Firefox Extension for a while now and find it quite useful. What's the first phrase of the post? "An interesting side effect of Google Notebook's integration with Google Bookmarks is that you can now bookmark search results without having to install plug-ins or use bookmarklets." And you are nice enough to inform me that you can use the bookmarklet or Notebook's plug-in. I don't understand what Google is doing with bookmarks. Jumbling them all up in an "Unfiled" notebook is both unintuitive and useless. Even after I tag the bookmarks, they stay in "Unfiled." I can't understand what I'm supposed to do with them there. Am I wrong? These functions must be browser-specific and/or using a plugin. I do'nt see the "note this" link or the "My Notebooks" link you mention. I can confirm that this does not work in Safari on the Mac. i can confirm that it does not work in Opera 9.25 either. come on Larry Page and Sergey Brin; tell me that you understand the power of choice, and the power of Opera, regardless of the market share. it is we the educated that refuse IE, and it is we the educated that are most-likely gTragics. we want to live on a mobile online office and we use gMail, gNotebook, gReader and gDoc to the max. but when they do not work (properly) in our browser of choice (regardless who's to blame), we don't have the gLuxury, do we ..? i can confirm that this is OLD news! As I already saw this feature probably a year ago, but it dissapear later and I don't have it at the moment... so I guess Google is just experimenting still. @pascal: you forgot to show that you have to click the my notebooks link.